This pie just screams summer! I've been wanting to try a fresh strawberry pie for a few years now. I don't know why it took me so long - it's so easy and so delicious. It's a good thing I'm slowly but surely working my way through 25 Pies of 2015 to give me an excuse to finally make it. 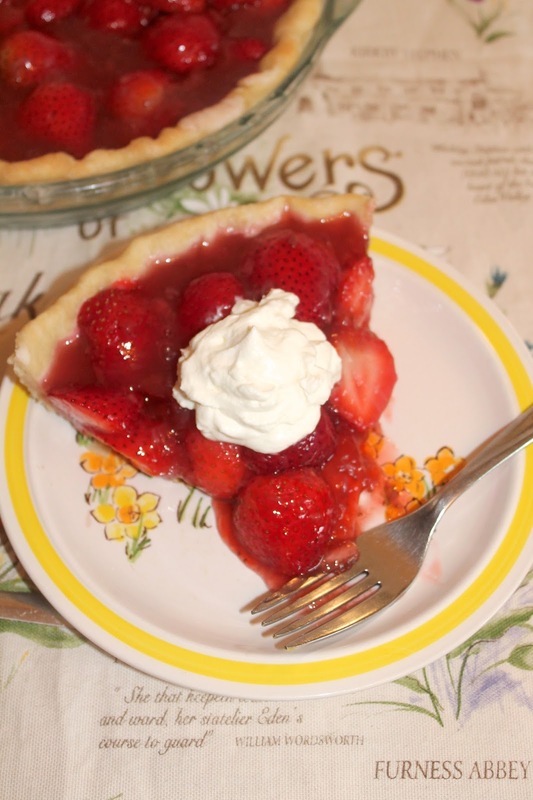 Fresh strawberries are held together with a mixture of sugar, cornstarch, and more strawberries and piled into the crust. The filling isn't baked, so you have a nice cold pie full of summer berries. A lot of versions of this pie use strawberry gelatin to hold the pie filling together, but this one doesn't. We really enjoyed this pie a lot. I can't get enough strawberries during strawberry season. They just aren't the same at other times of the year. Homemade pizza is a staple in our home. We love pizza, and since I started making homemade crusts, it's become a very popular dinner for us. The varieties are endless. Seriously. 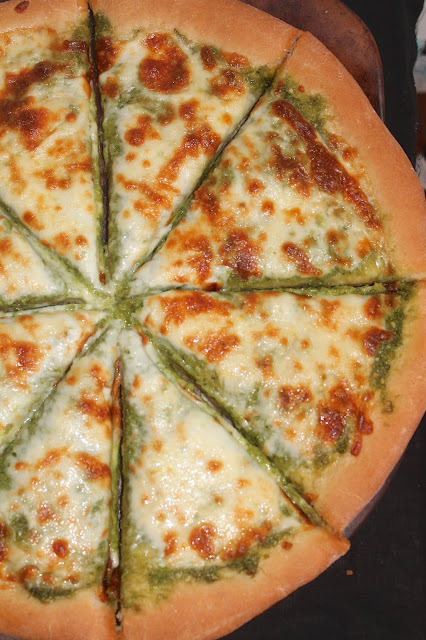 Pizza is a terrific way to be creative in your toppings and flavor combinations. Also, you can try different crusts like a regular yeast crust (as in this case), sourdough, pan, thin crust, and even pumpkin! We make a lot of seasonal pizzas and this one is no exception. I saw a bunch of lovely garlic scapes at the farmers' market last weekend and had to grab them. I was deciding how to use them and turning them into a pizza sauce stuck in my head. This will make one 12-inch pizza. It's not a dish to make for a date night, that's for sure. The garlic flavor from the scapes is very pungent and delicious! If you haven't tried garlic scapes yet, give them a try this spring. Salad season is upon us! Lots of lettuces and other greens are growing. Chances are if you belong to a CSA, have a garden, or are visiting the farmers' markets, you are experiencing the plentiful greens and other salad fixins. During this time of year, we try to have a dinner salad one night a week, and then for lunch a couple of times. When we have side salads with our meals, our dressing tends to be on the boring side -- just vinegar and extra virgin olive oil for the most part. But, when I make a main course salad, I like to make a tasty homemade dressing to compliment the ingredients. 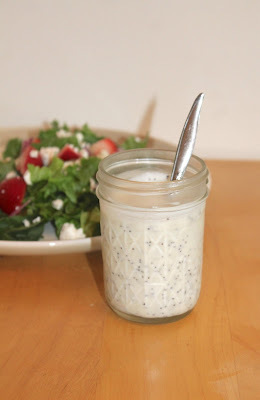 Sweet and creamy poppy seed dressing has always been a favorite of mine, so I figured I was long-past due to make it at home. I served this dressing with a salad of spinach, green leaf lettuce, strawberries, red onion, feta, and grilled chicken breasts. It went very nicely with the flavors of that salad. The recipe makes about 3/4 cup of dressing and it was just enough for two large dinner salads and two smaller lunch salads the next day. 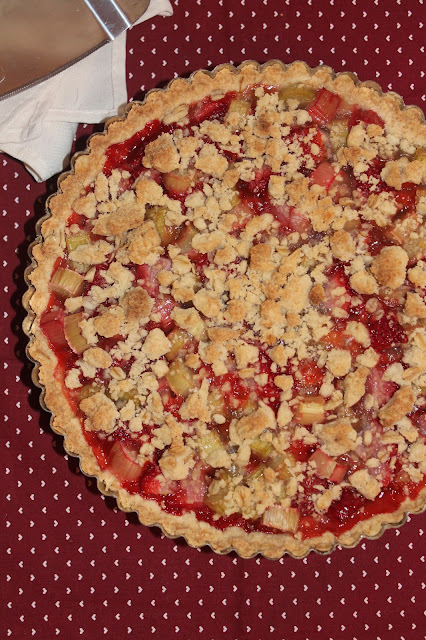 I had a few stalks of rhubarb left from making my strawberry-rhubarb crisp tart that I was trying to think of a different way to prepare. I wanted the rhubarb to be left pretty simple so I could really enjoy the tang and sourness of it. I can't get enough rhubarb this year. I have a few more recipe ideas that I want to try, so I'm hoping I can get it at least one more time this year at the farmers' market. Rhubarb is totally inspiring me! This is hardly a recipe - it contains only three ingredients. 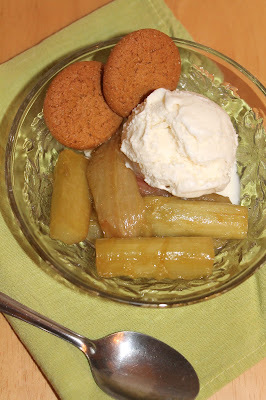 However, the rhubarb became so soft and it almost melted in my mouth when I ate it. 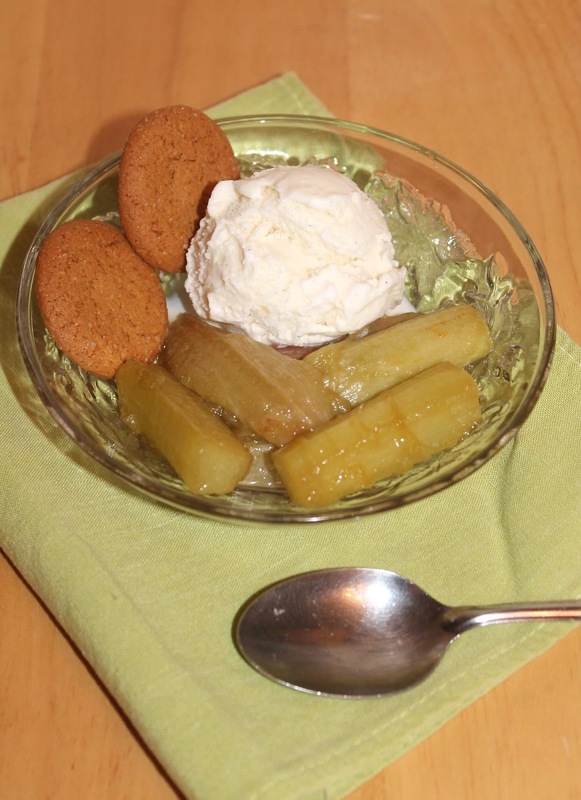 The warm, sour rhubarb paired so nicely with the cold, sweet vanilla ice cream. I added a couple ginger snaps on the side as well. The roasted rhubarb would also be delicious on yogurt or oatmeal, I think. This recipe will make two servings. For every 1-1/2 cups of rhubarb, I use 1-1/2 teaspoons of coconut oil and 1 tablespoon of light brown sugar. The entire month of May, I only posted two recipes. Two! I realized this yesterday and felt a little bad... It happens a lot this time of year that I just feel rather uninspired when it comes to food. I'm tired of winter foods, but we haven't quite gotten into the growing season here yet. It's also my busy time at work and my husband has been working evenings and some weekends. So, I just haven't really had a ton of motivation to cook new things lately. To tell you the truth, we've seen more than our fair share of peanut butter and jelly sandwiches lately - probably too many. However, I found some rhubarb at the farmers' market this past weekend and it inspired me to make a dessert. It's a tart/crisp/pie combination that I modeled from this apple crisp pie. It also let me add another recipe to my 25 Pies of 2015 challenge. This tart was a lovely early summer treat that combined two of my favorites - strawberry + rhubarb - making it burst with sweet-tart freshness. Topped with vanilla ice cream while still a touch warm from the oven, it makes a perfect ending to any meal. So I'm going to try to get re-inspired now. I promise.